SPIA's emphasis on capacity building is reflected in this 60-page guide, published in May 2010 by the European Commission. The guide was written by SPIA's director, Terry Martin, following lengthy consultations with the SSH* unit of the European Commission's Directorate-General for Research & Innovation. The guidebook is being used as a reference work for SSH project coordinators to plan and implement policy-relevant dissemination activities. 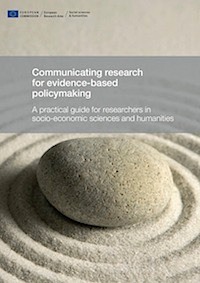 Addressing fundamental communications issues associated with research, this highly accessible publication offers practical advice on how to invigorate the science-policy interface. The guidebook provided a foundation for the EU-funded SCOOP Masterclass series targeting SSH researchers. Held in Brussels between 2009 and 2012, the Masterclasses helped acquaint delegates with the principles and methods needed to overcome the science-policy communications gap. SPIA’s director co-delivered the masterclasses, focusing on communication methods highlighted in the guidebook.